Broker Brain gives you the ability to create one or more Email signatures for use when sending emails. Signatures can be formatted with different fonts, sizes, and colors. You can create a default signature for use on every email, or you can create multiple signatures to select from when emailing to different groups of people. You can also attach an image to an Email Signature. You can also use Email Signatures to create templates for emails you send repetitively. Just create a new Email Signature and type the email information into the Note portion of the Add Signature box (just be sure to add your signature at the end, as you can only use one signature per email). 2. 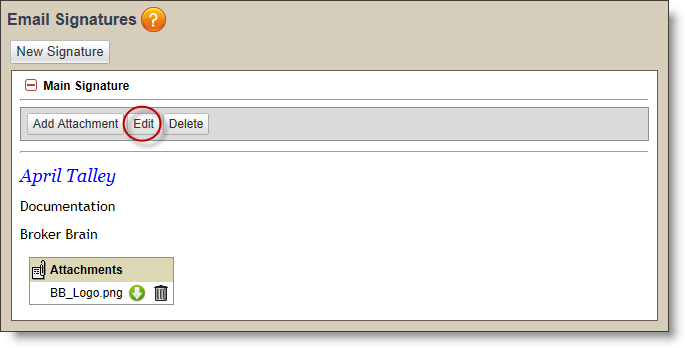 In the Add Signature box, locate the Subject field and add a title for your signature. Title the signature you use most often as Default. 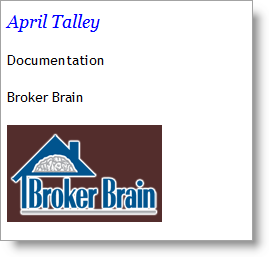 Broker Brain will use that signature when sending emails unless you elect to use another instead. 3. Click in the large white area of the Signature portion of the screen. Type your signature as desired, then highlight it and format it in the desired style, format, font, and size using the drop down menus. 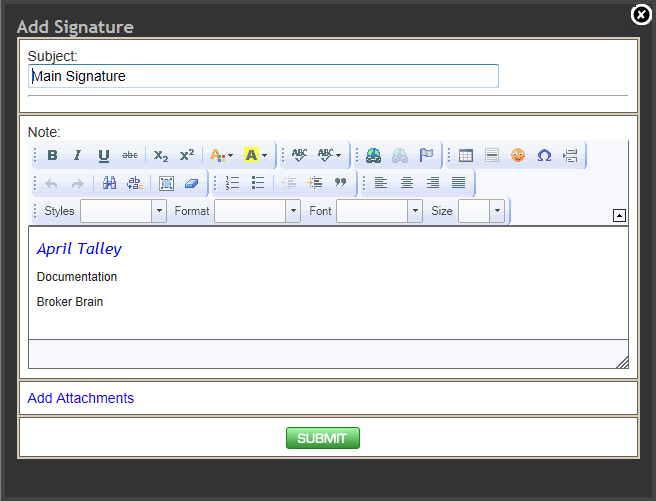 If you are creating a signature to use for repetitive emails you send, add the email text here. 4. You can also add Property, Offer, or Preservation macros into the signature. Click on the orange button shown below for a complete list of macros available (Note: you will need to scroll down to see the list). You can copy and paste macros from here into your email signature. Note: You can also click here for a categorized listing in the Help Documentation. Where you are in the system determines whether or not macros will pull the desired information. If you send an email containing a preservation macro from a section other than Preservations (including the General Notes area at the bottom of the Preservation screen), the desired information will not display (the macro itself will display; for instance, %bid_amount%). If you send an email with an offer macro from somewhere other than the Offers tab (or from the General Notes area at the bottom of the Offers tab), Broker Brain will display information from the accepted offer. Property specific macros will display information for the property you are currently in, and can be sent from any sub tab. 5. If you would like to add an image or other attachment to your signature, click Add Attachments (in blue at the bottom of the box). If you do not wish to do this, skip to step #8. 7. Locate and attach the desired file. Note: You do not have to put .jpg at the end; use the file extension attached to your file; .jpg, .png, etc. -- see our example circled in the screen shot below. 10. Click the green Submit button. Be sure you use a lower case i when typing in the word "image". An upper case I will cause your image to show as an attachment.